Mosley threatens to quit, quits, then threatens to re-instate himself after Ferrari brands the ex-FIA boss a dictator. In the latest of the drawn-out debacle that is Formula 1, Max Mosely has reportedly written to Ferrari president Luca di Montezemolo and demanded an official apology for calling him, in a roundabout way, a 'dictator'. According to the Times Online, Di Montezemolo made the comment after the F1 budget cap scheme was dropped on Thursday to placate the Formula One Teams Association (FOTA) and prevent a split F1 series. It was at this time that Mosley allegedly announced his intentions to retire, and the comments by Di Montezemolo were made. 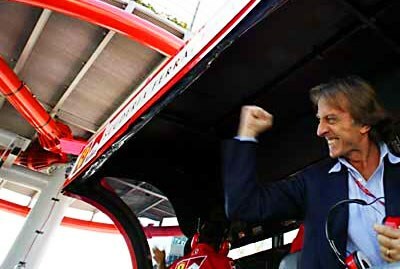 "The satisfaction is that all of our requests have been accepted," said Di Montezemolo. "To us, three things were most important: That F1 stay F1 and not become F3; that there is no dictator, but that there was a choice of rules, agreed and not imposed; and that whoever had a team was consulted and had a voice." "If you wish the agreement we made to have any chance of survival, you and FOTA must immediately rectify your actions," said Mosley in the document." "You must correct the false statements which have been made and make no further such statements. You yourself must issue a suitable correction and apology .... Formula 1 is run entirely by our 25-strong team without any help from me or any other outsider." "There was no need for me to involve myself further in Formula 1 once we had a settlement. "Given your and FOTA's deliberate attempt to mislead the media, I now consider my options open." "At least until October, I am president of the FIA with the full authority of that office. " "After that it is the FIA member clubs, not you or FOTA, who will decide on the future leadership of the FIA."